Hey folks the following three reviews are going to be a bit different as they are so late. I have been out town for awhile now and was unable to see, let alone write a review. These will be a couple paragraphs long. No explanation, just opinions and thoughts. I hope you enjoy never the less. 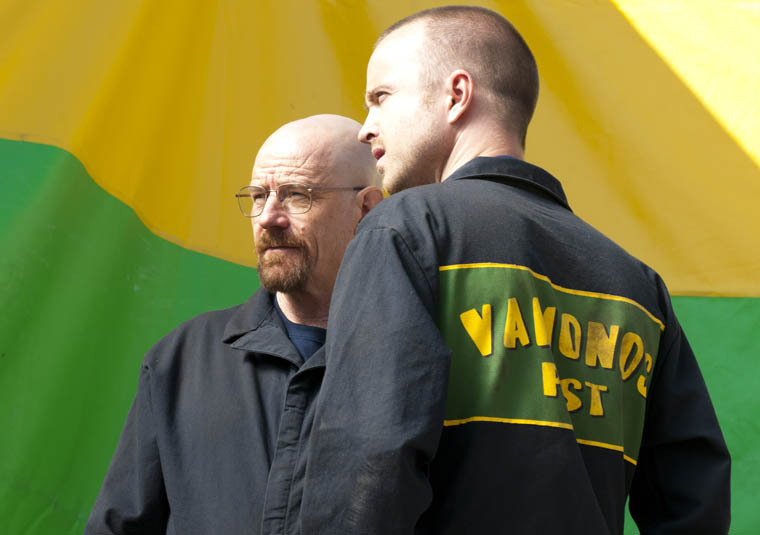 What can I aside from Breaking Bad has been firing on all cylinders this season. Despite some qualms I have with the episodes, these do not hold a light to the genuine genius that has been occurring line to line within these episodes. “Hazard Pay”, further proves this, making it my favorite episode so far this season. Like the previous episodes this one was about tying up loose ends, but more importantly how to expand the empire. Although this started slowly, I am really happy that it led to something that is both creative and just downright clever. I mean a moveable lab disguised as a pest control unit, plus using large band cases to hide all of the meth equipment. Holy hell! Sometimes I wonder about the writers on this show and whether this comes from experience. Never the less, this was a great way for them to begin anew. It would have been odd for them to simply have a lab built after the death of Gus, and so I am happy that they have been slowly building up Walt’s little empire into something far grander. Another part I enjoyed about the episode was Mike, just Mike. After last episode I have gained even more admiration for the character, but now I downright adore him. Mike running the business is the best option for Walt, although he may disagree with Mike’s hazard pay for his other employees. He has been in this business far longer, and knows the ins and outs not only of the drug trade, but of the police force as well. Lastly, I particularly enjoyed the little character moments in the episode. Walt awkwardly sitting beside Brock, not a word said between them (does Brock know what Walt did to him?) or Skyler’s breakdown in front of Marie, I mean she is married to a drug lord. Despite rebuilding an empire the writers have not forgotten to build up the characters in which we have come to know so personally. “Hazard Pay” was one amazing feat of an episode. If the writers can continue on this path, viewers may be looking at the best season of Breaking Bad, let alone one of the greatest seasons of television.